Description: (obverse) The winged figure of Victory bestowing a laurel wreath on the head of Britannia standing in the prow of a gallery with a Union Jack shield behind her, her right foot on a helmet, her left hand holding a spear. (reverse) wreath of laurel and oak leaves. Comments: Instituted in 1795, this medal was awarded continually until 1815. Large medals were awarded to admirals and small medals to captains. 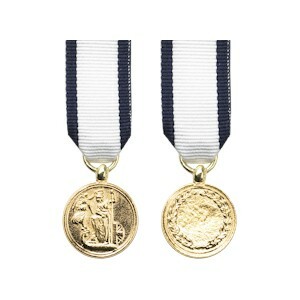 Lord Nelson had three of these medals, each for a seperate action. Only two miniatures are recorded.